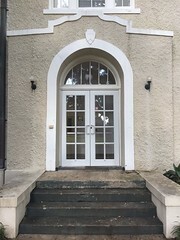 Preservation in Mississippi has actively followed the progress of Prospect Hill Plantation since 2009, when Malvaney posted “An Important House Needs Our Help.” Since 2011, Prospect Hill has been owned and slowly but steadily restored by The Archaeological Conservancy, spearheaded by The Conservancy’s Southeast Regional Director Jessica Crawford. 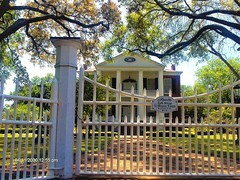 Prospect Hill Plantation was immortalized in Alan Huffman’s book, Mississippi in Africa. Earlier this month, Huffman spotlighted another endangered antebellum plantation that needs to be rescued: Georgiana Plantation, near Cary in Sharkey County. 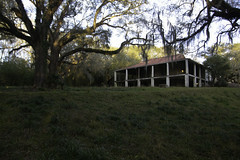 In a January 8 post, “Saving Georgiana,” Huffman chronicles the plantation house’s long history. As stated before on Preservation in Mississippi, despite its reputation, the Delta was never an antebellum plantation kingdom. The Delta was composed of far too much primordial swamp for that to occur until widespread drainage projects in the late 19th and early 20th Centuries. Some antebellum settlement did occur but only in scattered pockets with an ever dwindling number of extant buildings. This makes Georgiana an especially important house as it was constructed circa 1840. Not only is it a rare antebellum Delta plantation, but it is an unusual raised cottage with a lower-ceilinged brick first floor, a cypress log second “main” floor, and a frame half story under the side gable roof. Stylistically, vernacular is the best description. It has massing similar to Greek Revival raised cottages of similar age but no Greek Revival detailing. Charles Weissinger, whose family owns Georgiana and who farms the surrounding land, hopes to find a way to bridge that gap, to preserve the house as a valuable remnant of the Delta’s long and complicated history — and avoid the fate suffered by so many other vanished historic structures in the area. 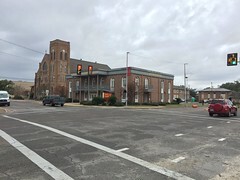 In Weissinger’s view, “Georgiana is the number-one unaddressed house in Mississippi” when it comes to endangered historic sites. Because Georgiana and the last of its adjacent slave cabins are deteriorating, Weissinger said his family has decided to offer the structures and surrounding acreage to an individual, agency or group that will restore and protect them – for free. “My father talked to family members about restoring the house, but no one had the money,” Weissinger said. “If someone agreed to preserve Georgiana in perpetuity, we’d be willing to donate it,” he said. Anyone with experience restoring and maintaining historic buildings knows that “free” is a relative term, but there is no question that Georgiana is worthy of preservation. The house and its outbuildings are the only surviving antebellum structures in the area, and fill an otherwise empty niche in the state’s architectural inventory: That of a rustic, absentee plantation home with matching slave quarters that illustrates the workings of an antebellum cotton empire in its original context and setting. Weissinger is likely correct in that Georgiana Plantation is Mississippi’s most ignored historic house. 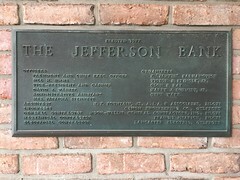 It is not listed on the National Register, and the MDAH HRI listing has some photographs from 2008 but no architectural or historical information. With a restoration of the highest quality, it is possible that Georgiana would not only qualify for the National Register but also as a National Historic Landmark since antebellum plantation landscapes with intact slave cabins are so rare. This is an incredible opportunity to preserve one of Mississippi’s rarest types of historic buildings: antebellum Delta plantations. As Huffman discusses in his post, Georgiana is the last antebellum plantation remaining in the area with its contemporaries falling victim to weather, neglect, disinterest, and architectural salvage as recently as the 1980s (not including Altorf Plantation in nearby Brunswick, Warren County which was demolished in 2011). 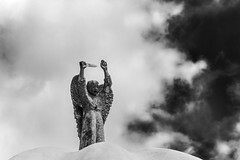 As we have seen with Prospect Hill, the challenges in raising the funds to do needed repairs will be difficult but not insurmountable for an individual or group of committed historic preservationists. Hopefully, either a newly formed or long established preservation group or a well heeled individual will commit to taking on this restoration project. This is an extraordinary discovery for me — my aunt by marriage, Ethel Goodman Wade (Mrs. William Stacy Wade) lifelong resident of Cary, took my mother and me to visit Georgiana many years ago. I live abroad and regret not having the means to contribute to this worthy project. Happy to keep informed. Hello — I just saw your reply — months later! Thank you and pleased to hear from Aunt Ethel’s family (the name “Toot” comes back to me!). I don’t know, but I thought at the time Aunt Ethel took us there that it was part of her family history. Sorry not to have further details. I very much miss her and my Uncle William — he, and my Uncle Charlie, his older brother, both passed away in their 60’s, way too early, but Aunt Ethel was with us into the 1980’s, and my mother and I were able to visit her often at Wade’s Woods in Cary. She was always a favorite in our family. All the best. Considering the important and violent history written up by Huffman, I hope that someone has notified the Slave Dwelling Project to inform a larger network. Hot off the presses – Georgiana is the subject of an article in Mississippi Heritage Trust’s latest edition of Elevation. We were honored to have Alan Huffman write the article as only he can do. We wholeheartedly agree that this is a vital and most worthy project for preservationists – low-heeled or high! We stand at the ready as always to help further this project in anyway we can. Our 10 Most Endangered List for 2017 debuts in October and this vehicle for advocacy and awareness is one of many tools in our toolbox. We stand by W. White in his/her keen observations written in today’s post. We ask that all and any join us and stellar preservationists like Alan Huffman in saving this rare treasure of our past – good, bad or ugly – it has a story to tell. My Grandmother’s home stood adjacent to this treasured site (until my cousins burned down the house cooking bologna sandwiches). Such childhood memories came back from reading this article.